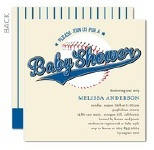 Hit A Home Run With The Sports Baby Shower Theme! Choose a theme that is a slam dunk! 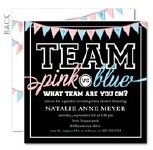 The sports baby shower theme is a no-brainer when guys are invited to the baby shower. For a fun and irresistible time, you cannot go wrong with sports! 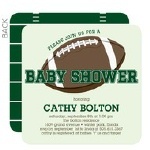 Just popping in to announce a sports baby shower for our Most Valuable Players (father) and (mother). They are announcing the upcoming arrival of their little rookie. Come ready to cheer for the home team! Decorate onesies- Set out a table for your guests to decorate onesies for the new baby. Provide different decoration for them to use like cute material or felt, templates, iron on paper, fabric paint and markers, buttons, etc. We have cute ideas for decorating onesies here. Autograph the ball- The guests get to pretend they are an all-star signing an autograph. Take pictures of them while they sign the ball for the baby. This can be arranged later in a cute picture collage showing the all-stars that came in support of the new rookie. You can also have them write advice on a larger ball. It can be advice on taking care of a child or parenting as a couple. Water baseball- For this game you will need a water bucket. Fill it with water balloons or water and a large sponge for the ball. This game is the same as baseball but a lot more fun! Place a special chair or bench for the mother and any other pregnant women so they can cheer everyone on! Stroller obstacle course- Test the new dad's ability to take care of a child while adding a fun twist. Place a baby doll in a stroller and set up obstacles for him to maneuver around. Time him on speed and his ability to keep the baby safe. Test other mommies and daddies to see if he is up to par with the seasoned parents. Musical Bottle Race- You will need 3 baby bottles filled with juice to start this game. Form a circle with the chairs and randomly hand the bottles to 3 people around the room. When the music starts. The bottles are passed around like hot potato. The people holding a baby bottle when the music stops have to drink it. The person who drinks their juice the fastest wins. This is a really fun game to play with guys. Everyone will have hurting cheeks by the time they are done. Lol! Bottle Bowling- Just like normal bowling but the items you use are a little different. Use baby bottles for the pins and tennis or other small ball to bowl with. Feed The Baby- Divide the players into teams of 2. You can play this game with any baby food that comes bottled or in containers. Blindfold the players and instruct them to feed each other. The team that finishes their food first, wins. Use garbage bags to protect the guest's clothing and some sort of tarp or floor protection if you are not playing this game outside. Any sports related item would work well with this theme. Decorate with t-shirts, caps, jerseys, sports balls, mitts, gloves, bats, golf clubs, etc. Take a large cloth or disposable diaper and fill with golf balls. Add a creative twist by making oranges look like basketballs. Use marker to draw the ball lines on it. Think of the kind of food you would eat at a sporting event. Stock up on hot dogs, hamburgers, fries, chips, pop, nachos, corn dogs, snow cones. It might be fun to have big league chewing gum and bubble gum tape for those who like to chew while playing. Popcorn, whistles, water bottles, Gatorade, or any kind of sports like products you can find. Hope you had a ball! Thank you for spending the afternoon with us.